Camden Catholic's senior football players surround new coach Cody Hall. Tyler Tompkins said the situation "broke my heart." Liam Mertz said it was "hard to believe." Ajani Hypolite said "it didn't feel real." They are among a group of 10 seniors who still pull those green jerseys over their heads and take the field for the Camden Catholic football team. They are survivors of something that no other class at any other school in any other sport has been through in recent South Jersey sports history, if ever. In one sense, they have been stranded by a storm. But they also are proud survivors, surrounded and supported by each other, and they have set their sights on making the best of what looms as a surreal senior season. "Those seniors," Camden Catholic coach Cody Hall said. "I can't say enough about them." 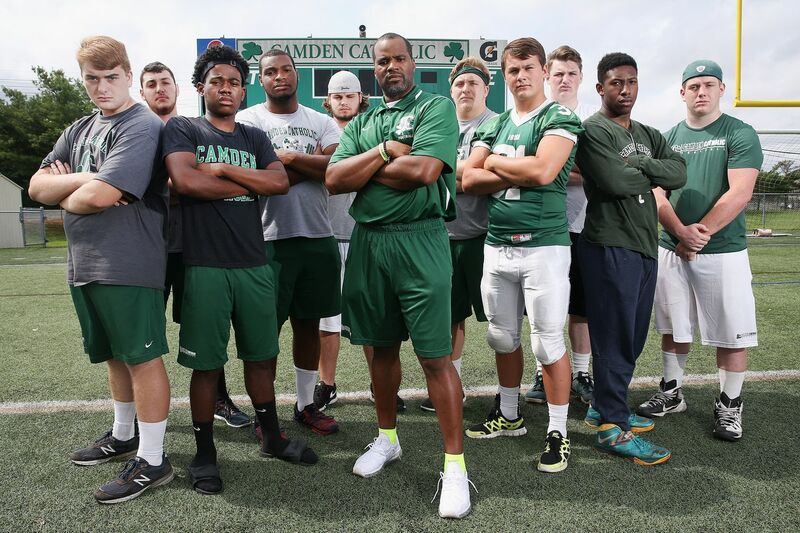 Ten seniors and new coach Cody Hall have been tasked with starting a new era for Camden Catholic football. The energetic, intense Hall, a former teacher and assistant coach at Glen Mills School in Delaware County, Pa., was hired as the Irish's new coach in June. He inherited a complicated and sensitive situation after former coach Nick Strom had been relieved of his duties in May under controversial circumstances. Strom, whose teams went 34-6 in his four seasons, charged the school administration with pressuring him to play fewer black athletes and creating an uncomfortable environment for minority students. Camden Catholic officials denied the claim. The ensuing firestorm — which included student walk-outs and protests, racially-charged rhetoric and national media coverage — pretty much burned down the program as more than 35 athletes either transferred to other schools or elected not to play football for the Irish. That left Hall and his assistants with a program heading into the 2018 season with a total of around 30 players, 17 of whom are freshmen. "We're going to be limited just by our numbers," Hall said in a realistic assessment of the Irish's chances of handing the competitive demands of a challenging schedule. "We know we are all we have. This is what we have. This is still our team." The seniors who stuck with the program find themselves in a strange new world. Their old coach is now the offensive coordinator at Eastern. The assistant coaches are gone as well. Most of their teammates have left, scattered to programs such as Burlington Township, Willingboro, Eastern and Camden, among other schools. "My best friend [lineman Oliver Lilly, who transferred to Willingboro] is gone," said Tompkins, a top offensive tackle and defensive end. Tompkins, who lives in Florence, said he considered transferring as well. But he didn't want to sit out 30 days under New Jersey State Interscholastic Athletic Association eligibility rules. He also felt a sense of loyalty to the football team and the students that remained in the program. "It really was heart-breaking," Tompkins said. "But the guys who stayed, who dealt with these problems head on, we've gotten stronger. We're all here for each other." The Irish have a long history of football success. Mertz, a top center who lives in Haddon Township, said he never seriously thought of leaving the school. "We want to show people we're still here," Mertz said. That's been a theme for the seniors, a cause around which they have rallied. If nothing had happened, Camden Catholic likely would have been a preseason Top 3 team this season. Now, the Irish likely will be the underdogs in every game of a schedule that was strengthened this season based on the team's past success. "We're not feeling sorry for ourselves," said Hypolite, a defensive lineman from Lumberton. "We're pushing through. I know personally, I'm very motivated to show what we still can do." Said senior fullback/linebacker Sean McClean, who lives in Lindenwold: "People think we're nothing now. We're going to prove them wrong." Hall, who has been hired as a Camden Catholic administrator to focus on "being an advocate for the students," will try to rebuild the program with a talented freshman class as the foundation. "I've been doing this a long time, and I've got some freshmen who can play," said Hall, whose team opens Aug. 31 against 2017 South Jersey Group 5 finalist Rancocas Valley. "But the core of our team is our seniors, just being really tough up front on the offensive and defensive lines." Camden Catholic will play strictly a varsity schedule this season, with no junior varsity team and no freshmen team. The roster will be an odd mix of newcomers to high school and seasoned veterans who have been through something that few other senior classes — at any school, in any sport, in any state — have experienced. Most of the seniors are linemen, tough grinders who will try to set the tone for the team and ease the transition for the younger players. They also plan to prove they can handle the adversity of the situation. "We have to act like men," said offensive guard Nick Obuchowski, a senior from Maple Shade. Joe Punchello, a senior linebacker and fullback from Burlington Township, said that has made the bonds between the athletes who stayed even stronger. "When we break down, we're 'Irish,' and we're 'Family,' " Punchello said. "That's what made what happened so hard. We were like a family, but we didn't stay together. "But the guys that are still here, we have each other's backs. We're here for each other. We know we are all we have. This is what we have. This is still our team."